I’m excited to be a Happiness Crusader today. I am joining over 100 women in spreading the message of Choosing Happiness to other women around the world. Today, I will talk about happiness in my little corner of the world--and what happiness means for me at the moment. I will be answering a few questions from my inspiring friend, best-selling publisher, Linda Joy as I discuss why happiness is...letting go. 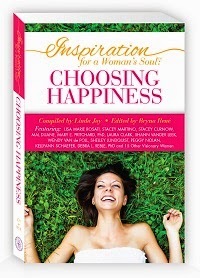 Today is the official release of Linda Joy's new book, Inspiration for a Woman’s Soul: Choosing Happiness. She features the soul-inspiring stories of 27 amazing women who share their intimate stories of transformation. Choosing Happiness also includes Reflection Questions after each story which will empower you to integrate the vital lessons of each woman’s journey into your own life. For a limited time you can get over 40 transformational gifts with your copy of Choosing Happiness. Grab your copy today. 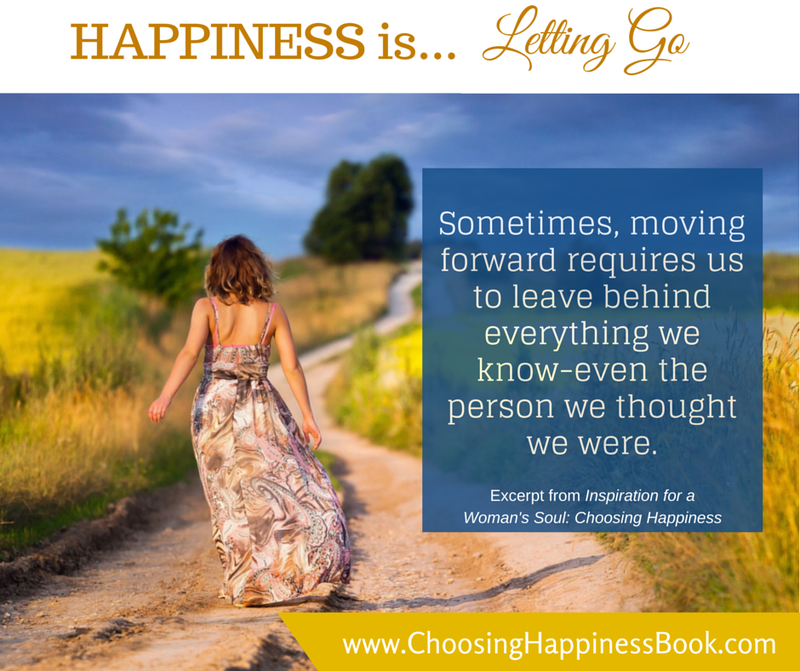 Chapter 7 of Linda's Choosing Happiness book is titled "Letting Go"--but, currently, this is probably the most important step for me in my ongoing effort to live in happiness. There was a pivotal moment my my life when I realized that my happiness was an internal choice. In spite of the outside circumstances, I could choose to be happy.....or choose to be miserable. I turned 40, the pieces of my life were not where I had envisioned, and extended family circumstances created daily chaos--and pain. Something had to change. Since I cannot control outside circumstances or the change the actions of others--I can only control my own actions and change my own responses to those things. I discovered the need to let go. Let go of the past. Let go of the guilt. Let go of the pain. Let go of the fear. I needed to let go so that my hands and heart were free to reach for happiness! How do I remind myself that happiness is always within and regain my footing in those whirlwind moments of life that can throw us off balance? Each day presents new happiness challenges--with some days presenting many more than others. Each evening is a time to reflect on the day and refocus my energies toward the next day. Toward the future. I have not yet reached the point where I can "let go" during the day's moments--but, simply being able to focus my energy on letting go at the end of each day prevents a bad day from turning into a bad week....a depressing month...an unhappy life. What is my personal definition of happiness today? Finding peace and reasons to smile amid chaos define happiness for me at the present. Our family's life is busy. It's hectic, stressful, and packed with less than perfect moments--but, each one of those moments happens for a reason. Each of those moments offers a lesson, brings an opportunity to learn or grow, and adds a piece to life's puzzle. Letting go of negativity, even if that "letting go" happens after the fact, returns peace to my days. My life is good--even when bad things happen. Peace. Peace does not necessarily mean quiet....just a lack of conflict. Conflict has a purpose in life. We need conflict to grow and change--but, I do not need constant conflict. I have zero tolerance for unnecessary drama. I have zero interest in creating conflict simply for conflict's sake. Surrounding myself with those who also limit unnecessary drama brings me peace. A Purpose. We all have a purpose--and working toward goals and dreams helps us fill those purposes. I know that I have a purpose. Sometimes I lose sight of my myself in the grand scheme of the day--but, in the end, I can always let go of the less than perfect moments, reflect and realize that, even in chaotic situations, I was still serving a purpose to myself and my family. Little things. Sometimes we get so focused on life's "big picture" that we lose sight of the many little things which really make our lives worth living. Every day is filled with little moments. Sometimes, I have to let go of the to-do list and look away from the window to the future to see them. This is how I am currently choosing happiness. It seems like such a simple choice--but, the process is really not an easy one! Sometimes we all need motivation, support--and even some reminders--that it is okay to be happy. It is okay to choose happiness! I invite you to share how you are choosing happiness in the comments below. Be sure to check out Linda’s new book, Inspiration for a Woman’s Soul: Choosing Happiness and grab your copy today at http://bit.ly/Happiness_Book to receive the bonus gift bundle worth thousands! Disclaimer: I am participating in Linda Joy's Book Launch--but, was not compensated for my participation.